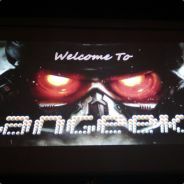 Langeeks are Dorset based, aiming to provide you with good quality wholesome gaming. LAN PARTY ! WHY... CAUSE I GOTTA ! 1st-3rd September. LGUK 17-3 is on this september 1st till 3rd. Head over to langeeks.co.uk to book your seat for the entire weekend, or just come for a saturday, the choice is yours. Grab yout seat now to avoid missing out. Please register yourself by going to http://lanhub.net by clicking "sign in" then login using steam. Then go to the stupidly long ling http://lanhub.net/LeetEvents/Join/60a4144dd0724758b9a3f3bfa50a6dcb to join the LGUK2015 event. we can then create tournaments for upcoming games. A one off event for 2013 - a chance to catch up with some old friends, or meet new ones. The normal things apply, its a BYOC event, Limited to about 30 spaces, Internet available, No Showers, No scheduled Games, Just start a game and see if anyone wants to play, Movie Friday, Take Away Saturday. along with the usual fun and games.. Please Register And Pay On the website www.langeeks.co.uk . We require a minimum of 15 Attendees SIGNED up and PAID by the 21st June. Any punters that would like to sign up after 21st June, will be subject to the £25 entrance fee. Agreed... all those please sign up to Shinylan.. it's a great social lan with organised games galore. With the smell of sizzling sausages in the air and the feeling of sweat pouring down my clammy brow the realization that it's Summer finally dawns on me. Of course, with Summer comes the ShinyLAN Summer LAN which has started to creep up on us given it is less than 7 weeks away! Even without this group signups are starting to appear which indicates a reasonable turnout. BBQs will be had (weather permitting! ), Tournaments WILL be played (see polls on forum) and Goose will be ridiculed so come on down and join us. Whilst I have your attention, please vote on the polls to decide the tournaments and more importantly get signed up whilst your there! Even if you can't yet pay, please stick your name down as UNPAID on the site to give us an idea of numbers. If you are feeling flush the usual early payment discount will be active until 30 days before the event which will give you £5 off your ticket!